This morning my five year old was trying to get the tap water to come out warm. He kept fiddling with the hot valve to try to get it just right. This was a time consuming process. 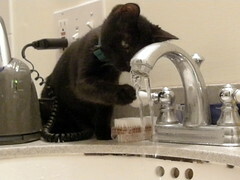 A simpler solution of course is to use the cold valve (which I explained to him). Most people think about exercise when it comes time to stay fit. How about just eating less, a little less at a time. There are two ways to balance your out of wach budget: spend less and make more. Most people only look to one or the other- they should use both. There are two ways to achieve career advancement: promotions within or moving to a new company. Most people pick one tactic or the other. Some people always look to move on. “They just don’t appreciate me here” they say. But the pattern repeats itself at each job they take. They should consider trying to make their current company appreciate them and realize what their contribution is. Sometimes just asking for a promotion is enough to get the ball rolling. Try to get concrete steps on what the criteria for the promotion is. Then there are others who just stay at a company for a long time waiting for their promotion. They have been promised a promotion or were told “soon’ but the promotion never comes. This may be because the company doesn’t adequately value your contribution and perhaps never will. It may be time to look externally. Start feeling around for a new job. In any task your doing, think about other approaches. That may give you an easier way to acheive your goal.